Fiction – hardcover; Putnam Publishing Group; 368 pages; 2007. Review copy courtesy of publisher. 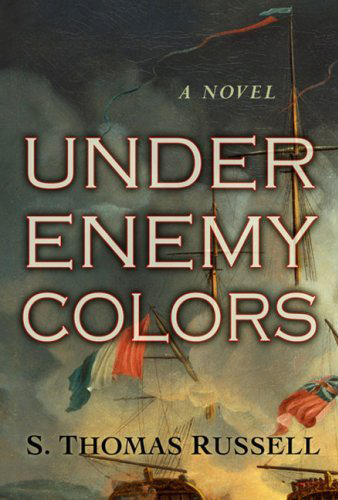 Although I’m not an expert on the naval genre, many of my favourite novels — Barry Unsworth’s Sacred Hunger, Joseph O’Connor’s Star of the Sea and Matthew Kneale’s English Passengers — have been seafaring adventures, so I had rather high expectations for S. Thomas Russell’s Under Enemy Colors. I’m pleased to say I was not disappointed. Set on board a newly-built British frigate, the Themis, during the French Revolution, it tells the story of two very different men working for the King’s Navy. The ship’s captain, Josiah Hart, is a notorious coward and an incompetent, bumbling, tyrannical leader, but the Admiralty has turned a blind eye to his failings because he is very well connected through Mrs Hart’s family. Charles Saunders Hayden, a seafaring man of impeccable ability, is his (reluctant) first lieutenant who has been secretly engaged to inform on Hart’s exploits. Hayden, who feels the role is beneath him, has only accepted the job because his parentage — his father is British, his mother French — has often been used to (wrongly) call his loyalty into question, and to refuse it would only jeopardise his career in the Navy. I have to say that I loved this book from the outset. Thomas Russell has an immediate and an easy-to-read voice that rings with period authenticity. He’s a master at suspense and is so good at capturing that sense of injustice that sets the reader’s teeth on edge this book should have come with a health warning. His vast cast of characters are imbued with a realism that is hard to fault. This is impressive given that Captain Hart could have so easily been turned into an over-the-top caricature. My only quibble is that Hayden’s personal struggle to come to terms with his identity as half-French half-English was laboured a little too strongly — such a dilemma wears thin after it’s been mentioned more than a dozen times. All up, Under Enemy Colors is the perfect mix of character- and action-driven entertainment, with a heady dose of history and humanity thrown in for good measure. It will appeal to those who love historical fiction or seafaring adventures or just want to get lost in a good old-fashioned action story. An iron ball shot from the cannon of a ship of the era could cover a mile and still embed itself three-feet-deep in the enemy’s oak. At close quarters, a fight must have been absolutely hideous. Below decks, the surgeon would remove limbs, sans anaesthetic, slipping about in a welter of gore. The stench of a ship at berth was notorious. Months of effluvia suppurated in the bilges along with ballast. Much of the time there was no activity. A ship of the English line might be stationed off a port simply to prevent the enemy from leaving. Tacking back and forth, week in week out. The great escapades, like Nelson’s pursuit of Villeneuve across the Atlantic and back (to Trafalgar), are what we remember, but much was sheer drudgery. I do not see a benefit in reading historical fiction. Real, academic history is entertaining enough and tends to use real detail that is not embellished by any art other than that necessary to keep the reader’s attention. You’d be better off with a book about Emma Hamilton. Her husband was the real hero, IMHO. Dean wrote: I do not see a benefit in reading historical fiction. Then you are free not to read them, my dear. I agree wholeheartedly with the revue of this book. I also feel that the angst suffered by ‘Hayden’ because of his half French/half English background was slightly laboured. As with the Patrick O’Brian partnership of ‘Aubrey’ and ‘Maturin’ I can see a partnership developing between Hayden and Midshipman Wickham although their difference in rank and similarity in temprament may stretch the readers credulity. An exellent first novel by Sean Russell, I look forward to his second offering due in 2009. Bill, yes, I too am looking forward to reading his next book. I didn’t know there was another one due next year. I assume it’s naval? I thought the language in the book was stilted, not true to the period and the education level of the rabble that would have manned the ship gathered from impress gangs, and the sea battles and descriptions of seamanship were out of books not out of any kind of personal experience.